After a fantastic first day in Las Vegas, the Heroes of the Storm Americas Championship came to a nail-biting finish Sunday with the top two American teams facing off against each other in a close fought five game series. Earlier in the day, Tempo Storm and Cloud9 claimed the two American spots in the BlizzCon World Championships, which will be held in Anaheim in November and feature the eight best teams from around the world. Sunday began with the final two matches of the Group Stage, starting off with compLexity Gaming against the lone international team still in the tournament, Relics. The Singapore squad won over a lot of fans with great Kharazim play by Zeys yesterday, and he brought the monk out again in both games. Unfortunately, compLexity had done their scouting and ran a sustainable composition with Tyrande, Uther, and Arthas that prevented the Seven-Sided Strike blow ups that Zeys showed off yesterday. compLexity also used Raynor’s Hyperion and Tyrande’s Starfall to establish area control, push lanes, and deal good damage. In the second game on Infernal Shrines, compLexity’s Jaximus demonstrated how powerful Rexxar can be against Shrine Guardians by building into his Bird of Prey talent, and they were able to grab every Punisher despite losing fights around the Shrines. Eventually the lane pressure was too much for Relics to overcome and they were eliminated from the tournament. In the last match of the Group Stage, Cloud9 faced Murloc Geniuses, who had pushed Tempo Storm to the limit on the previous day. In their first game, Murloc Geniuses used a strat that COGnitive ran yesterday with Illidan as their main tank and Tassadar and Abathur providing shields. Unfortunately, this strategy had little success against one of the world’s best teams, and Cloud9 was able to repeatedly pressure Illidan with constant stuns and prevent him from dominating team fights. In the second game, Cloud9 once again stacked their team with stuns and were able to sustain early push from the Murlocs and sweep into the Single Elimination phase of the tournament against COGnitive Gaming. With one ticket punched for BlizzCon, the other was up for grabs between COGnitive and Cloud9. COGnitive had won over the crowd on Saturday thanks to Glaurung’s aggressive melee play, but Cloud9 had the loudest cheering section all weekend so it was a fitting way to end the American Road to BlizzCon. COGnitive’s aggression in the first game got them a two level lead by the midgame as Glaurung’s Kerrigan hid between lanes waiting to eliminate heroes moving to defend Webweavers. Iakona showed off another impressive game as Brightwing, constantly baiting Cloud9 into Kerrigan traps. Unfortunately, a technical issue caused a pause in the game, and Cloud9 was able to regain momentum and take the game back after a huge team fight middle and several COGnitive members overcommitted to killing a Keep. This left Cloud9 to push all the way to the Core with both Webweavers and the Boss, despite trailing for most of the game. The win revitalized Cloud9 and they kept the momentum up in the second game, winning without any hero deaths and guaranteeing a spot at BlizzCon. Tempo Storm and Cloud9 have been the top two teams in North America for over a year, maintaining one of the fiercest rivalries in Heroes. Many fans were looking forward to seeing which team was going to take home the inaugural title of Americas Champion, especially after Cloud9 had recently broken a summer long losing streak to their rivals. The Americas Final was a best of five series that most figured would go all five games, and did not disappoint. Cloud9 took the first two games looking completely dominant, and nothing like the team that had lost badly to Tempo Storm in the Group Stage. Cloud9’s team captain Dunktrain claimed that they had been holding back their new strategies on Saturday in order to save them for the $40,000 matchup in the Americas Final, and it certainly seemed like Tempo Storm was caught off guard. In the first game, Tempo Storm drafted The Butcher with their second pick and it let Cloud9 pick easy counters for him to prevent his typical early aggression. Tempo Storm never was able to establish any map presence as Cloud9 seemed to know where the team was going before they did. Cloud9’s Fan used Muradin’s Dwarf Toss to constantly escape from gank attempts, and force Tempo Storm to overcommit or spread out too far. In the second game on Dragon Shire, Tempo again seemed to have trouble establishing anything on the map as Cloud9 took several Dragon Knights easily and rode their lane presence to another victory, leaving them only one game away from claiming the title of first Americas Champion. Tempo Storm refused to go quietly though, as they drafted much better on the next map, Battlefield of Eternity. They grabbed two strong ranged Assassins in Valla and Kael’thas and were able to apply tons of pressure on the Immortals. Zuna’s Leoric and So1dier’s Muradin showed the perfect amount of aggression, setting up kills on Cloud9 members who were trying to flank or flee. Tempo grabbed every Immortal by winning team fights in the middle and won the game easily after winning a fully shielded Immortal late in the game. They evened the series up at two on Sky Temple by once again dominating the map mechanics, using the siege damage of the Temples to pressure Cloud9 all game. Their control of the objective was so complete that caster Artosis called the team “Temple Storm.” Cloud9 almost eliminated them by grabbing a boss, but Tempo Storm defended it before winning a decisive teamfight and then marched to the enemy Core in their typical fashion. The Americas Final came down to one final game on Blackheart’s Bay, and it was the map’s only appearance of the weekend. Cloud9 was able to grab both Zagara and Tyrande in the draft and used the map vision to completely protect Blackheart so that Tempo Storm was never able to comfortably turn in any doubloons. At one point, Tempo Storm’s Dreadnaught had over 15 doubloons, and was unable to heal effectively on Rehgar because of the risk of dying. Eventually he was caught trying to turn in by a perfectly placed Sentinel from Cloud9’s K1pro and iDream landed a Devouring Maw to trap him, kill him, and steal those coins to secure a dominant win. Tempo Storm nearly came back from the two game deficit, but ultimately Cloud9 won with great map awareness and presence in their three victories. 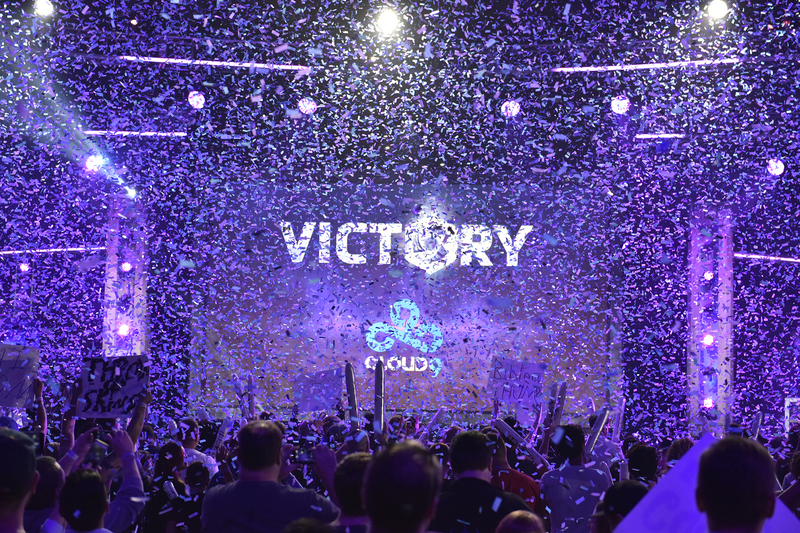 As the casters shouted “GG,” the confetti poured down over the Las Vegas Convention Center and Cloud9 celebrated their title as Americas Champions, as well as their $40,000 payday. Both Cloud9 and Tempo Storm are not done competing, though, as both will now begin practicing against each other in order to guarantee that the Heroes World Championship is won by an American team. If the Americas Final is any indication of the BlizzCon World Championship, you can expect many more exhilarating matches to come in Anaheim as both Tempo Storm and Cloud9 are far from finished.